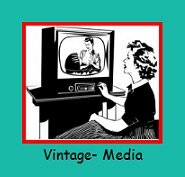 Vintage Media is an exciting category of all kinds of media over the years. Our favorite shows by decade, and by type of media. Fashion Shows, Movie Fashions, Magazine Ads, Vintage TV Shows, and TV Commercials. Whether it be man, child or women, they will be wearing something that is a sign of the times. You'll find many cool old fashions to inspire new fashion ideas to sew. Love this stuff! The first Barbie commercial, and a 1950's cigarette commercial, to name a couple. The fashion shows from past decades are really fun. One of them is futuristic. Or at least what they considered futuristic at the time. Enjoy your walk through time and fashion history. A great place to find inspiration.